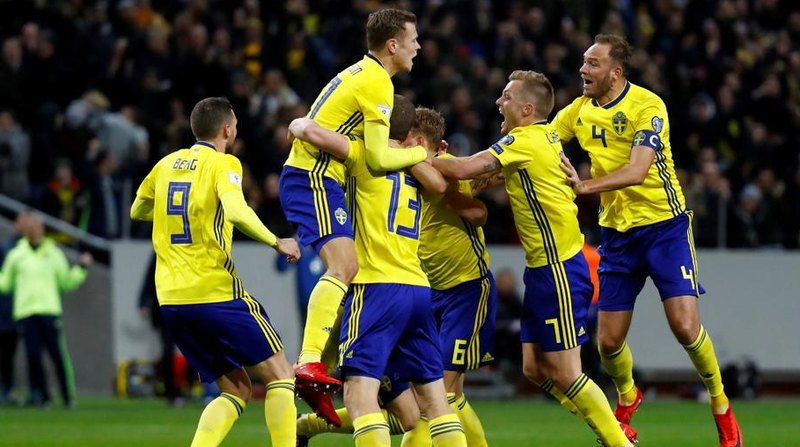 Sweden vs South Korea M12 Live Streaming, H2H, Line-ups, Preview FIFA WC 2018: The next match of FIFA World Cup 2018 is going to be played in between Sweden vs South Korea. Both the teams will be played their match at Nizhny Novgorod Stadium in Nizhny Novgorod, Russia. Both the team will open their world cup 2018 campaign on 18th June 2018 at the correct time of 15:00 MSK (UTC+3). Both the teams have faced each other twice in their previous meeting in International friendly matches and the result was gone draw match. No one won the match. The match between Sweden vs South Korea liveis to be telecasted on some channels like SBS, beIN Sports, Canal 13, TVC, Sky sports, Fox sports, Astro and more at 18:00 MSK (UTC+3). Sweden vs South Korea live match 12 will also be broadcasted live on radio on RTSH, SBS, HRT, ERR, Radio France, Blu Radio, RCN Radio, BBC or SR.
GOALKEEPERS: Robin Olsen (Copenhagen), Karl-Johan Johnsson (Guingamp), Kristoffer Nordfeldt (Swansea). MIDFIELDERS: Sebastian Larsson (Hull), Albin Ekdal (Hamburg), Emil Forsberg (RB Leipzig), Gustav Svensson (Seattle Sounders), Oscar Hiljemark (Genoa), Viktor Claesson (Krasnador), Marcus Rohden (Crotone), Jimmy Durmaz (Toulouse). DEFENDERS: Mikael Lustig (Celtic), Victor Lindelof (Manchester United), Andreas Granqvist (Krasnador), Martin Olsson (Swansea), Ludwig Augustinsson (Werder Bremen), Filip Helander, Emil Krafth (both Bologna), Pontus Jansson (Leeds United). FORWARDS: Marcus Berg (Al Ain), John Guidetti (Alaves), Ola Toivonen (Toulouse), Isaac Kiese Thelin (Waasland-Beveren). GOALKEEPERS: Kim Seung-gyu (Vissel Kobe), Kim Jin-hyeon (Cerezo Osaka), Cho Hyun-woo (Daegu FC). MIDFIELDERS: Ki Sung-yueng (Swansea City), Jung Woo-young (Vissel Kobe), Ju Se-jong (Asan Mugunghwa FC), Koo Ja-cheol (FC Augsburg), Lee Jae-sung (Jeonbuk Hyundai Motors), Lee Seung-woo (Hellas Verona), Moon Seon-min (Incheon United). DEFENDERS: Kim young-gwon (Guangzhou Evergrande), Jang Hyun-soo (FC Tokyo), Jung Seung-hyun (Sagan Tosu), Yun Yong-sun (Seongnam FC), Oh Ban-suk (Jeju United), Kim Min-woo (Sangju Sangmu), Park Joo-ho (Ulsan Hyundai), Hong Chul (Sangju Sangmu), Go Yo-han (FC Seoul), Lee Yong (Jeonbuk Hyundai Motors). FORWARDS: Kim Shin-wook (Jeonbuk Hyundai Motors), Son Heung-min (Tottenham Hotspur), Hwang Hee-chan (FC Red Bull Salzburg).